Thanks so much for all your awesome comments on my laundry room makeover. I really did not expect that sort of response. So thank you! 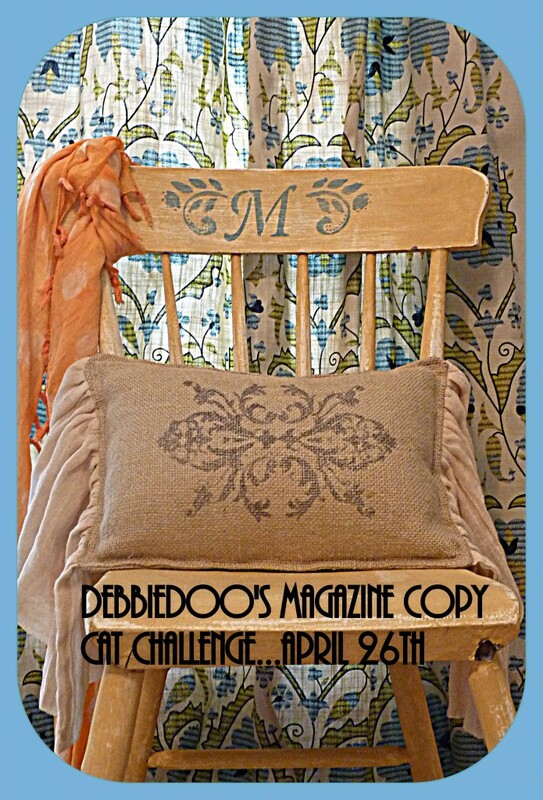 I have been gearing up for the Magazine copy cat challenge coming April 26th. 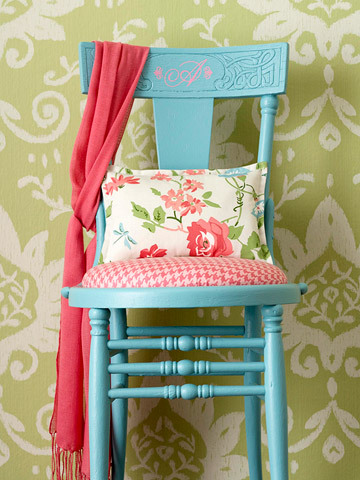 I found this gorgeous inspiration picture from BHG and thought, hey I can whip this up. was add a simple stencil embellishment. From Sonya beyond the screened door. I staged the desk area in our bonus room, and used the curtains as the back drop. 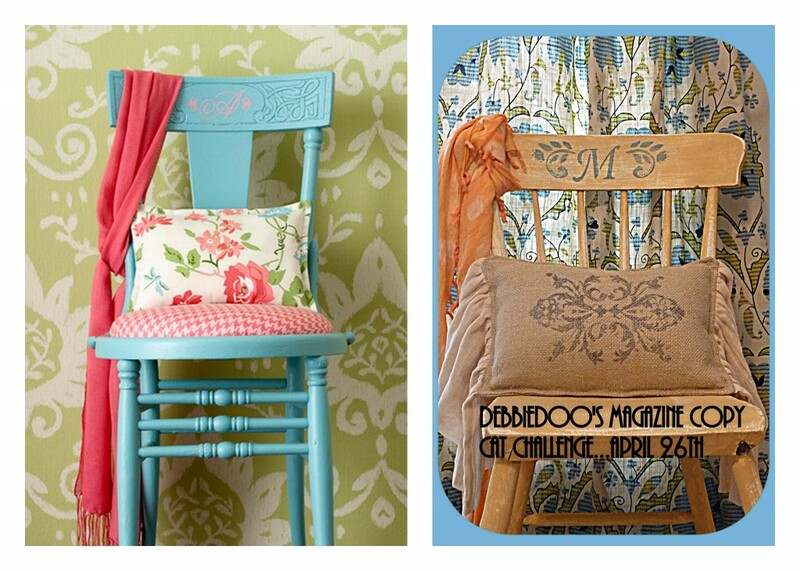 Stenciled the back of the chair….as seen in the inspiration pic. Took me all of a few minutes. Takes longer to actually create a post than to do the project. Hope to see you here on April 26th! Really is so much fun to see what you all come up with. Debbie, that is too cute! 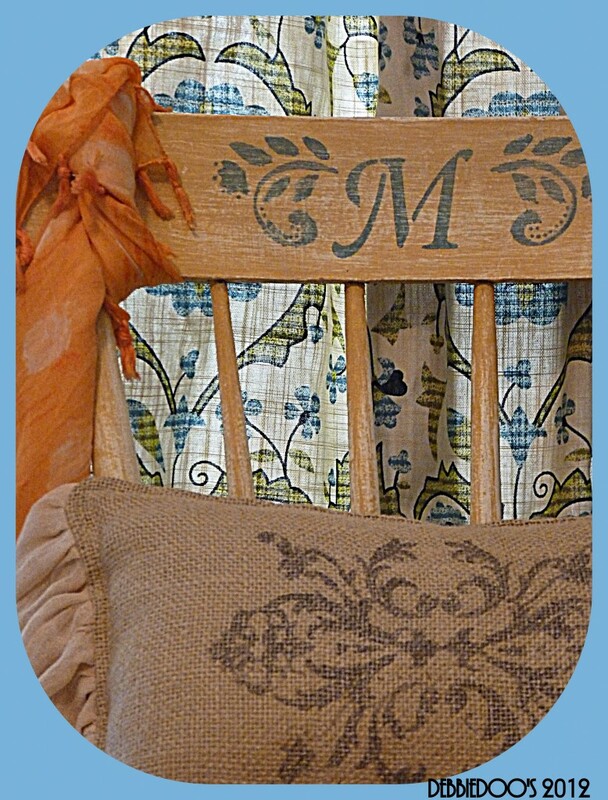 I love anything with a monogram on it! I swear I am going to do this copy cat challenge one time. When we get all moved and settled in, I am so in!!!! Love it, now I just need to find something to copy! Cute chair and love that pillow. Sweet! I love it and I love Sonya’s pillows! that one looks great with your chair, Debbie. I’m all ready for the party ~ my project is done, post is drafted and I’m patiently waiting for the party to start! You did a great job on your version. I like the monogram stencil on the back. I love it. You have such energy girl. I finally have one to come to the party with. Fabulous! I can’t wait to link up! I am trolling through my magazines now, but am tempted to just copy cat Shannon @ Fox Hollow Cottage’s beautiful aqua bench…I found one that needs some love! I love it, I like yours better to be honest. Really cool chair! !……love it. Now I have to find a “copy cat” project! Adorable! Great job with being inspired! So lovely Debbie! I love that pillow! Very nice and I love your pillow! I wonder if turquoise is one of the hot colors this Spring! I better get my doo going and think of something so I can PLAY!! Turned out well. And I LOVE your desk! I’ve been wanting to try chalk paint and keep reading that people wax it afterward. Could you please tell me what kind of wax you use? Is it Johnson & Johnson paste wax for floors–or something else? Rita, the wax I used is also by Annie Sloan. My stockist information is on my sidebar…Shade of Amber. They have some package deals as well that include the wax. Great stuff! You will not be disappointed. You can go online too Bliss for magazine inspiration. I’ll mark my calendar. Love your copycat challenges. Why, I will be there with bells on. I had my photo all picked out, ready to do the copy and now I can’t find my inspiration photo..
Gooing back to look for it again right now. Cute Debbie, Goodness you are have turned into the most creative DIYer! I remember when you said you weren’t much of a crafter 2 years ago and now you have turned into one of the best!! Next, you will need a booth to sell your wears! Or you will be turning up at my Fancy Flea. So cute – and simple (my favorite thing)! Oh I love it! I had better get myself in gear if I plan to join in the fun. Love what you did with your chair! I hope to be able to link up on Monday. I just started a new blog, (after losing mine) Would love it if you would stop over and check it out (you could let me know if everything is working ok) Thank you so much! Trying to find a chair to start!!! 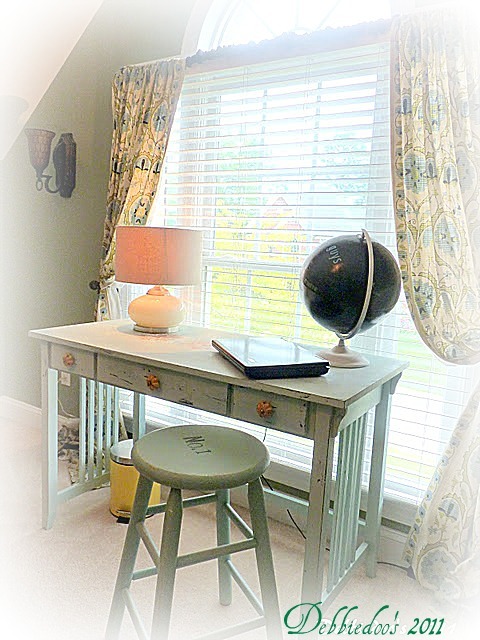 Did you paint the desk and if yes what color did you use?